Two explosions ripped through a crowd Saturday, killing four people and injuring more than 40 in Bangladesh's northeastern city of Sylhet. 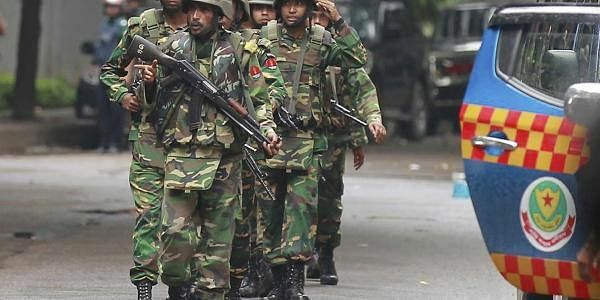 DHAKA: Two explosions ripped through a crowd Saturday, killing four people and injuring more than 40 in Bangladesh's northeastern city of Sylhet where army commandos stormed an Islamist extremist hideout, police said. The "powerful" blasts went off some 400 yards (metres) from the hideout, targeting police and hundreds of onlookers who were witnessing the commandos conducting an anti-militant operation at a five-storey apartment building, police said. "At least four people including a policeman were killed," Sylhet police spokesman Zedan Al Musa told AFP, adding 42 people including about a dozen police and security officers were injured. "Conditions of several people are critical," Atiqul Islam, an emergency doctor at Sylhet Medical College Hospital told AFP. Musa said police primarily suspect a new faction of the homegrown extremist group, Jamayetul ul Mujahideen Bangladesh (JMB), which has been blamed for a wave of attacks in recent years, for the the blasts. Police could not confirm whether whether it was a suicide blast. "It occurred in the dark when there was no electricity," Musa said. The blasts occurred hours after the commandos rescued "78 civilian hostages" from the hideout where several Islamist militants were holed up in a ground-floor apartment. "So far what we've done, our main task was to rescue the hostages, which we have done successfully. We were able to rescue all 78 people safely," army spokesman Brigadier General Fakhrul Ahsan told reporters. He said the extremists were still inside the apartment building where they "set up barricades" by "laying IEDs" in many rooms and stairs. "As a result the whole operation is being conducted carefully," he said. The commandos backed by armoured personnel carriers launched the operation after a more than 30-hour standoff that began early Friday morning when police sealed off the building as militants detonated small bombs. "They are Islamist extremists," police spokesman Musa said, adding they shouted "Allahu Akbar" (God is the greatest). The raid came after a series of suicide attacks on security camps by Islamist extremists this month including one at a police checkpoint near the country's main international airport on Friday night. Two of the three attacks, including Friday's blast in which the suicide attacker was killed, were claimed by Islamic State group. IS has claimed responsibility for a wave of killings since 2015 including for a major attack on a Dhaka cafe last year in which 22 people, including 18 foreign hostages, were killed.